Recent travels have brought me to the lands of legendary superheroes. One is the Giant's Causeway of Northern Ireland. Here the famous Finn MacCool roamed the north coast where he could keep an eye on his greatest rival, Benandonner, whose Scottish territory lay across the sea. Since the giants had never met, Finn invited Benandonner to Ireland, where they could engage in a decisive battle. 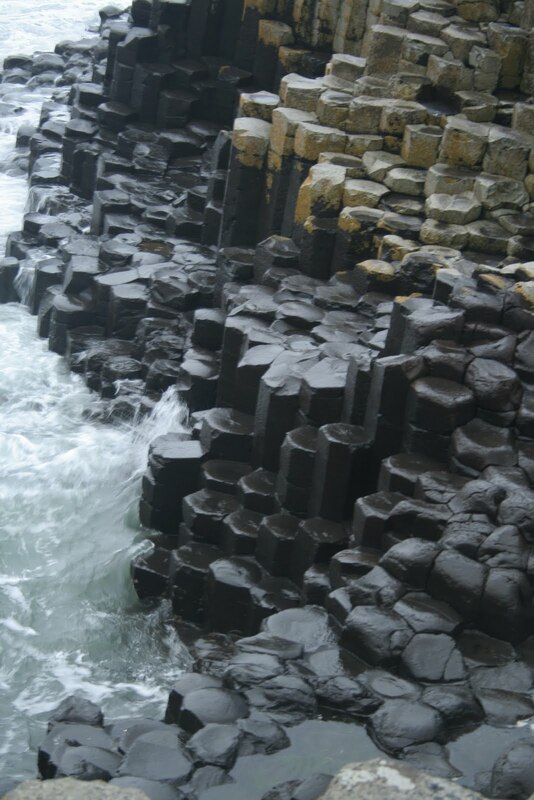 There were no boats large enough to carry the giants across the sea, so Finn built the causeway of huge stones that stretched across the Straits of Moyle providing easy access between the two lands. Benandonner would have no excuse to avoid Finn's "invitation," and he began the journey. When Finn got a glimpse of the huge rival, he was horrified! Benandonner was much larger and more fearsome that Finn imagined. He hightailed it home and asked his wife, Oonagh, for advice. She dressed him in a bed gown and bonnet and placed him in a huge, makeshift cradle. As Benandonner approached, Finn pretended to be asleep. Oonagh asked the giant to join her for tea with the stipulation that he not awaken Finn's baby. When Benandonner saw the massive "baby," he shook with fright, for if that was Finn's baby, just imagine how big and ferocious the father must be! Benandonner fled back across the sea to Scotland, destroying the causeway behind him so that Flinn could not follow. Today, the remains of the massive rock outcropping appear for tourists to enjoy.